2017 CNSA National Conference - Canadian Association of Schools of Nursing / Association canadienne des écoles de sciences infirmières (CASN / ACESI). 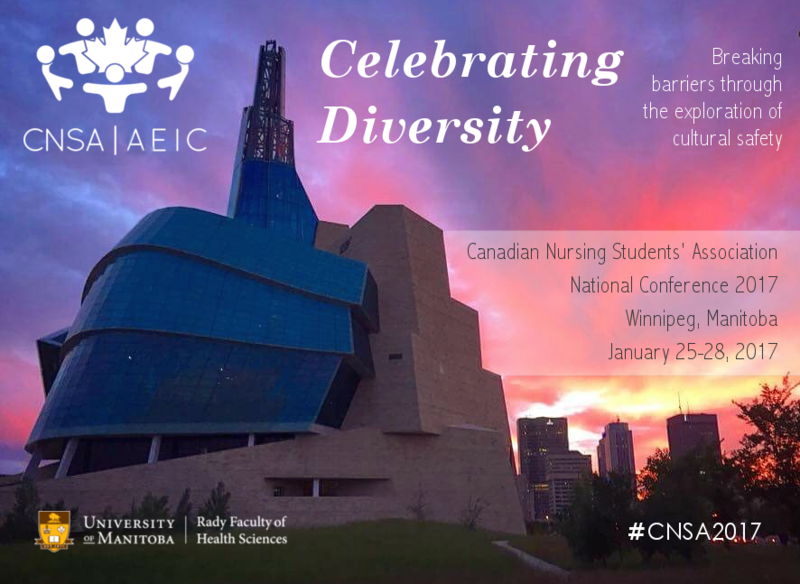 The Canadian Nursing Students’ Association is excited to announce the 2017 CNSA Annual National Conference to be held in Winnipeg, Manitoba from January 25-28, 2017. The theme of the conference is “Celebrating Diversity: Breaking barriers through the exploration of cultural safety.” Winnipeg is an up-and-coming city in the heart of the continent also recently named one of “2016 New Years Must-See Places” by National Geographic Magazine, this is an exciting opportunity to explore cultural safety through Winnipeg’s diverse population, attractions and festivals. With help from the University of Manitoba, Rady Faculty of Health Sciences, we will be exploring cultural safety through a wide variety of speakers, workshops, food, dance and social events.